The U.S. Air Force's robotic X-37B space plane came back to Earth today (June 16) after 15 months in orbit on a mystery mission, and its much-anticipated landing was caught on video. The X-37B spacecraft touched down at California's Vandenberg Air Force Base at 5:48 a.m. local time Saturday (8:48 a.m. EDT; 1248 GMT). Several hours later, Vandenberg officials released a short video of the event. The first part of the 80-second video was apparently shot in infrared light. It shows the X-37B space plane cruising in for an automated landing, its belly and nose glowing a bright orange-yellow, presumably from the heat generated during re-entry to Earth's atmosphere. The X-37B, also known as Orbital Test Vehicle-2 (OTV-2), launched on March 5, 2011, from Florida's Cape Canaveral Air Force Station. Its flight was the second-ever mission for the X-37B program; the first was flown by OTV-2's sister ship, OTV-1. OTV-1 blasted off in April 2010 and stayed aloft for 225 days, well below the supposed 270-day orbital limit for the space plane. But OTV-2 smashed that limit, zipping around our planet for 469 days before finally coming down today. Just what OTV-2 was doing up there for so long remains a mystery. Details of the vehicle's mission are classified, as are its payloads. The secrecy has spurred speculation — notably from China — that the X-37B may be a space weapon of some sort, but Air Force officials have long insisted that the spacecraft is simply testing out technologies for future satellites. The X-37B looks like NASA's recently retired space shuttle, but it's far smaller. 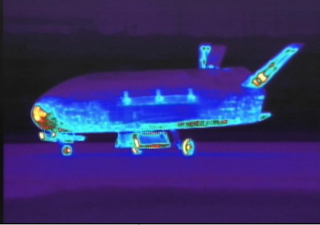 The X-37B is 29 feet (8.8 meters) long and 15 feet (4.5 m) wide, with a payload bay about the size of a pickup truck bed. For comparison, two X-37B vehicles could fit inside the payload bay of a space shuttle. The 11,000-pound (5,000-kilogram) space plane's orbital longevity is enabled by its solar array, which generates power after deploying from the payload bay.